"A free nation cannot survive without (them)." 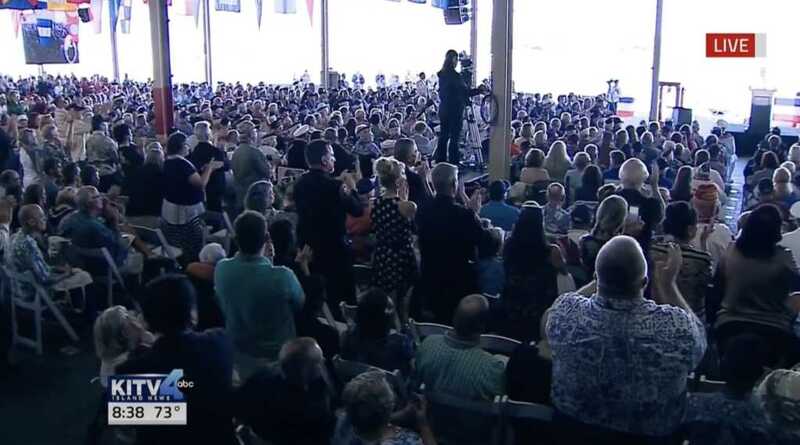 Veterans and service members delivered rousing applause and a standing ovation after U.S. Pacific Command Commander Adm. Harry B. Harris Jr. hit back at those who have been taking a knee in protest of the national anthem. Seemingly aiming at San Francisco 49ers quarterback Colin Kaepernick and others who have joined him in silent protest, Harris — who was addressing the crowd at an event commemorating the 75th anniversary of Pearl Harbor — spoke of the valor and bravery shown by the men and women who were under siege and died that day. “You can bet that the men and women that we honor today — and those who died that fateful morning 75 years ago — never took a knee and never failed to stand when they heard our national anthem being played,” Harris proclaimed. What followed was intense applause and a standing ovation, as many in the audience clearly agreed with the sentiment. Harris went on during his address to shower praise upon soldiers who have so willingly sacrificed for their country, saying their bravery and selflessness has helped make America the country it is today. Harris said these people sometimes take an “uncertain road” and are exposed to dangers, and proclaimed that “a free nation cannot survive without” such individuals. As Faithwire has reported, Kaepernick has faced controversy since deciding earlier this year not to stand during the national anthem in protest against police violence. – Americans Overwhelmingly Support Doctor-Assisted Suicide. But Evangelicals Take a Very Different Stand.